Rainbow's 24-hour Emergency Department is equipped to handle all types of pediatric emergencies including injuries, trauma, burns, poisoning, infectious diseases, seizures, and asthma etc. 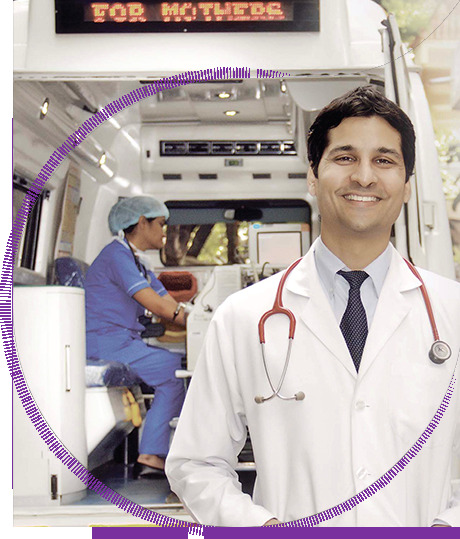 We have only exclusive "Hospital to Hospital" Transport services in the case of any emergency. We do not provide "Home to Hospital" transport services in the case of any emergency. The ER is manned by two trained pediatricians 24x7 even on public holidays and weekends. In addition to that, at least one senior consultant stays within the hospital premises even during nights, thus giving 24 x 7 senior consultant driven cover to handle any pediatric emergency. The hospital is located on Road No 2, Banjara Hills, Near L V Prasad Eye Hospital, next to Hotel Park Hyatt. The Emergency department is located on lower ground floor. We do not have emergency services at Rainbow Hospitals, Madhapur. Rainbow's Emergency Transport team is among the nation's leaders in the management and transport of high-risk neonates and sick children. Main aim of the Transport team is to provide the highest possible level of care during transport and avoiding any complications. If a child is being transferred, it is most likely because the referring doctor feels that he/she needs more intense, specialized care than the current hospital may be able to provide. State of the art equipment for ventilation while on transport, temperature regulation and monitoring equipment are provided in all the ambulances at all the three centers. Rainbow's Emergency Transport Services has transported several newborns and children from as far as around 300kms radius. We have a highly trained team of doctors and nurses to accomplish such a challenging task.